Royal Jordanian are the Flag Carrier for the Kingdom of Jordan, a country between Israel and Saudi Arabia. Founded by the Jordanian king in 1963, it is now a privatized company. Royal Jordanian is the first (and only) Arab airline to join a major airline alliance being part of One World. I have now flown 8 of the 12 airlines in One World (although one of them, Mexicana Airlines has suspended its operations and I wonder how long One World can keep saying they are a One World member). Finnair, JAL and S7 remain for me to fly. The Royal Jordanian website (www.rj.com) is reasonably straight forward. Getting human help for an e-ticket was more interesting. There is an Australian sales office in Sydney but they referred me to a number in Jordan, who fixed up the ticket and then sent me back to the Sydney sales office! Both the Amman and Sydney offices were very friendly. I found the Sydney office a little chaotic throughout. I love airlines with online check in but found Royal Jordanian's a little more complex than I think it needs to be. Seat selection was easy-ish and I got my coveted emergency exit seat. Then I thought I had lost the seat because of the confusing way, RJ displayed the seat selection so I re-chose the seat, to find that I still had it. Royal Jordanian has a very good system of emailing you confirmations of regarding seats, though. Boarding pass collection at Bangkok airport was easy. I was invited to use the Thai Airways Silk Lounge. I had used this last year when I had flown with Thai. What seems strange to me that Royal Jordanian a member of One World uses a Star Alliance airline's lounge and not the Qantas/Britsh Airways lounge. Wonder what that is about? Cost? The fact they are both connected to Royalty? I boarded late so I missed seeing if the boarding process was smooth or chaotic! I am not sure whether the announcement in the Thai lounge was at the end of the boarding process or if it was a very rapid efficient process. The welcome from plane entrance to my seat by all of the on-board crew was very warm. It was done in English and or Arabic depending on the guesses over the passenger's language. The crew was a diverse mix with all the males being Jordanian and all but one of the females not being Jordanian. There were two Thai flight attendants, one from Ecuador and one from somewhere in Eastern Europe. The crew were all very friendly, very attentive and very welcoming and worked well. They were definitely proud of their airline but I did not get an impression of them being an overly cohesive crew today. I was traveling on an Airbus A330, a 300 seat twin engined plane. I am not a huge Airbus 330 fan, The cabin looked great: clean and airy. The colour scheme is very nice. Blanket and a pillow were provided at every place it seemed. Economy aisles are quite narrow. On reaching my coveted exit aisle seat, I found it occupied. The occupant laughed and shrugged and offered me the bulkhead seats across the aisle. I took it figuring the leg room was almost as much as the seat I had reserved. Having already been travelling for 14 hours, I was not really ready for a discussion! The leg room difference was enough that next flight, I will demand my seat. They have a combined Business First section which I think leans toward the business end. Looked very comfortable and spacious with lie-flat seats. Immediately, after takeoff, cabin crew brought round refreshing towelettes (yes, yes, yes). Amenity kits which consisted of the head sets came next. No little tooth paste and brushes were provided here. Safety demo good and clear with crew checking belts etc very well -with one major exception. In my row at the other end was an "interesting passenger". He moved himself from his assigned seat to an empty bulkhead seat. He carried out shouted conversations to his friends all over the plane. He refused to put his seat belt on for take off and landing. He refused to switch his mobile off and was texting as the plane came into land in Amman. He ordered the stewardesses around in a way that I thought was rude. Interestingly, the female attendants seemed quite unassertive with him. They did make him put his luggage out of the passage way into the luggage compartment (“but I need it close” he said). The flight attendants pretended they could not see he was not wearing his set belt and I watched them gaze at him texting and look away. If there are genuine safety issues here then, this needs to be dealt with. My problem "friend" decided soon after dinner, that he would sleep on the floor of the bulkhead. 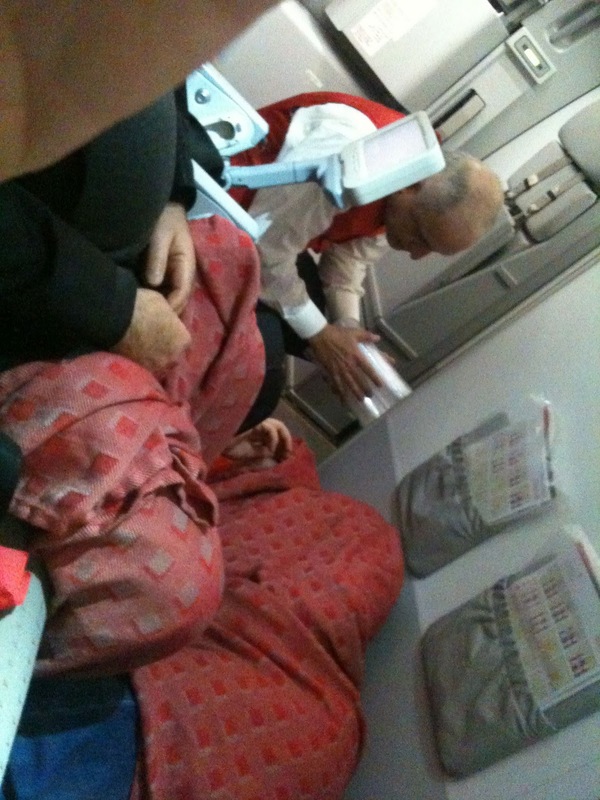 A male Jordanian steward spent some time remonstrating with him to take his seat and he finally moved. 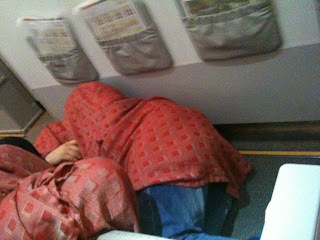 A hour he returned to the floor and another guy curled up on the floor at the emergency exit and they stayed there for most of the flight. Qantas would have a fit!! The ride was very smooth for the whole flight which is of course, always luck! I wonder what they would have done with the floor sleepers if it had been rough? We were delayed out of Bangkok because of "traffic" and the captain clearly advised us over the PA system about this delay- twice. Finally, we pushed back -over 40 minutes late. Our nose wheel left the ground and we seemed to move down the runway for a long time with the plane's nose in the air and rear wheels on the runway before lifting off into the Bangkok post midnight sky. There was no written menu provided for the trip. 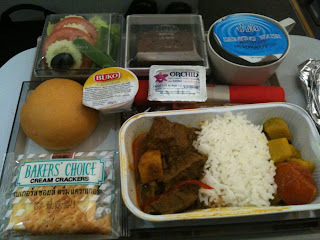 I chose the beef dish which was delicious but the staff did no mention to me that it was spicy hot. This did not bother me but for some fliers, it may be a shock! 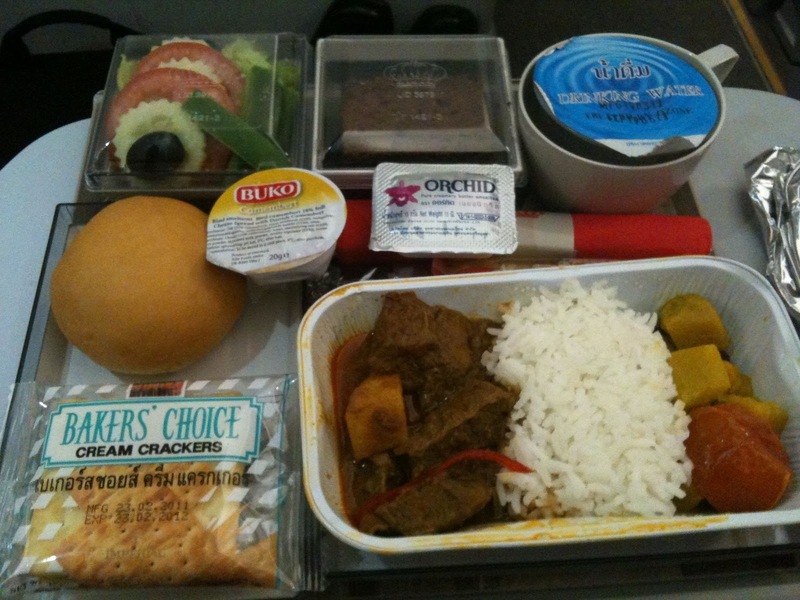 Also on the meal tray were a bread roll, excellent fresh salad, crackers, a camberbert spread, water and a chocolate dessert (which I did not eat). 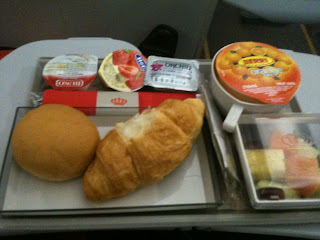 After such a nice dinner, breakfast the next morning, was a little disappointing but perfect adequate. The roll was a little stale and the croissant was cold. I assumed they would have heated it. I was also surprised at how western, the breakfast was. No Fetta or Olives, for example. The cheese spread and jam were excellent and the fruit was very fresh and very refreshing. Fascinatingly, the provision of Australian Berri Orange juice. Royal Jordanian had water available in the galley but no food/snacks through the flight. They did give me a nice cup of assorted nuts without me asking for them) as I attempted to watch the Narnia Dawn Treader movie. They made it clear as they gave me the snack, that I was very welcome to order any drinks at any time. I did not observe them passing through the cabin offering water through the night (something Qantas do well on long haul flights). On my short connecting flight from Amman to Beirut, I was stunned to be served a very delicious sandwich and drink. There were no choices with the drinks and no coffee served but I was impressed (as always) with the hospitality. 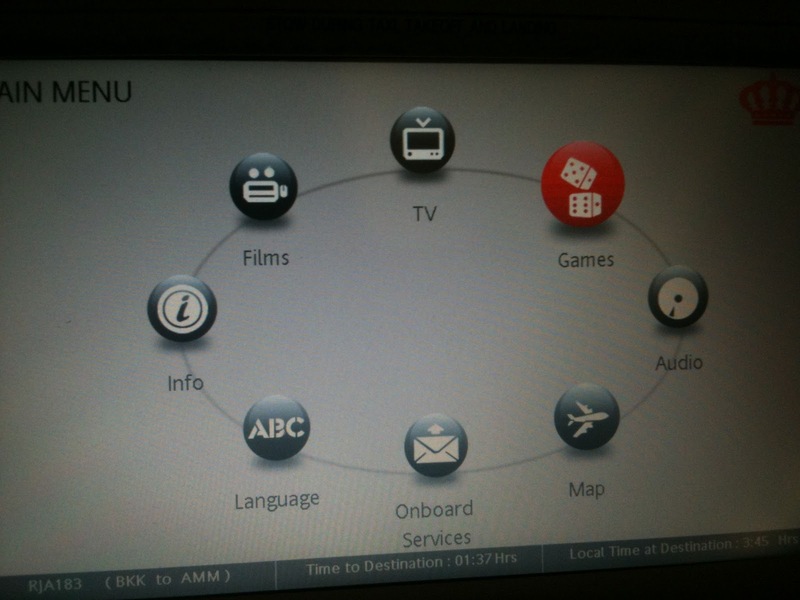 The reason for not appreciating the Narnia movie (mentioned above) was nothing to with the brilliant Royal Jordanian entertainment system. I just hated this movie adaption of my favourite Narnia book). The system itself works very well. The interface is excellent and works smoothly with good menus. I thought selection was limited. Not enough for a nine hour flight. Only one 30 minute Arab music video, for example?Likewise, only 3.5 hours of comedy in total (including 4 eprisodes of the offce and one of Molly and Max- iw atched them all). I tend not to like watching movies on planes. Here is where I catch up on TV! The headphones provided were okay. Every passenger was given a survey form and envelope to send back to Royal Jordanian. The survey asked about aspects of Royal Jordanian service. I documented my concerns re the safety over My Seatbelt man. I was interested they asked no questions about their food. Landing was pretty well right on time at 516am (scheduled 515am). Not bad after a 40 minute delay. It was one of the smoothest landings I have ever had in my life. We were warmly farewelled from the plane by the crew. That part of the arrival would have given RJ 10/10. The next part of the experience let them down. 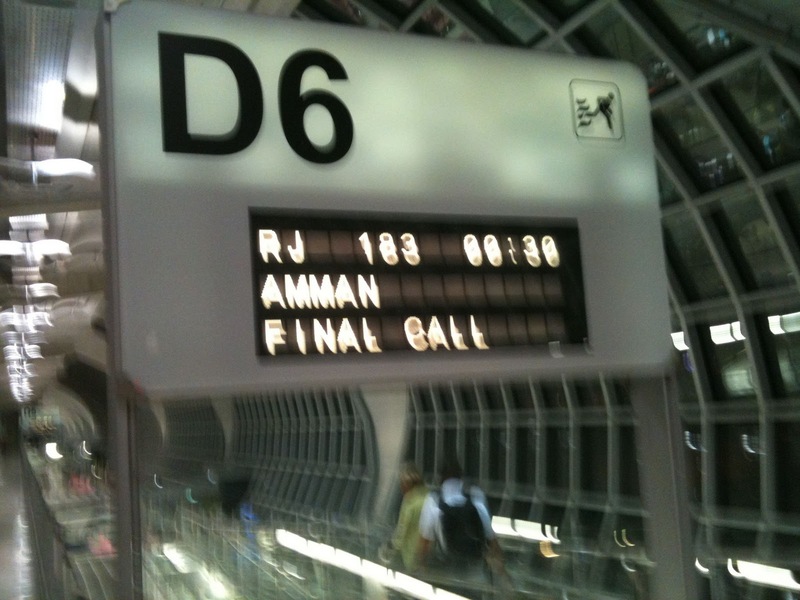 On arrival in Amman, I attempted to switch to the earlier flight (6am) to Beirut which I had been told might be possible by the Royal Jordanian booking office in Sydney. "Flight departed sir". I was told. "I see it still on the screens". "No sir". As I walked away from the counter, I heard them calling the flight! I popped into the Royal Jordanian Crown lounge for my five hour wait for my connecting flight to Beirut. It is the biggest lounge in the whole of the Middle East. Lounge Staff: “sorry sir , you are too early . You can only use the lounge 3 hours before your flight”. He then explained there was a transit bus that would take me too a neaby transit hotel for a rest. I followed his directions and ended up unable to find the counter he was referring me to. I asked someone else who pointed me in the opposite direction and alas still no transit counter was there either! So I sat in an airport cafe using the wifi from the Crown Lounge. 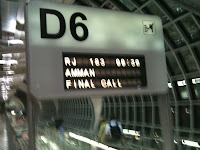 I will do an Amman airport report soon! I found the 3 hour rule interesting -anyone else encountered this with a lounge? For me, Royal Jordanian is way better than any American Carrier but not quite as good as Cathay, Singapore, Qantas or Air New Zealand and not near Emirates levels. I found them about the same or a little better than British Airways which would put them in my Top Ten airlines- so far. I have three more flights with them! The difference being that BA seem to be declining and Royal Jordanian give an impression of improving. Their major selling points are their warm hospitality, new aircaft and membership of One World (Frequent flyer points/status credits, Lounge access and World wide connections). more on this topic? I'd be very thankful if you could elaborate a little bit further. Bless you! Did you create this amazing site yourself? Please reply back as I'm wanting to create my very own blog and want to learn where you got this from or what the theme is named. Many thanks! I am actually happy to read this weblog posts which contains lots of helpful information, thanks for providing such data. his web site, because here every stuff is quality based data. Hello to every body, it's my first go to see of this blog; this blog contains awesome and in fact good stuff for visitors. moment this time I am visiting this website and reading very informative articles at this place. Really love your overview of this airline as i have no experience with their services. do you review other airlines as well? i would love to read about your opinion and experiences! Yes Its Really Great Stuff! Appreciate your sharing blog. ثانيا تعمل الشركه علي توفير خدماتها لجميع العملاء وتتواجد بشكل مستمر على مدار 24 ساعه حيث اننا نصلك اينما كنت ووقتما تريد فنحن معك شركة تنظيف بالخبر لاننا نمتلك اكبر فريق عمل داخل المملكه يقوم باعمال التنظيف علي اكمل وجه وافضلر شركة تسليك مجاري بالقطيف حال ممكن ويقدم مستويات باهره للغايه . ثالثا الاعتماد على مجموعه من أفضل المنظفات والمعقمات المتميزة مثل الكلور والديتول حيث ان هذه المنظفات اثبتت بشكل كبير جدا فاعليتها ودقتها وقدرتها علي احداث الفارق واخراج اي بقع واتساخات شركة مكافحة حشرات بالجبيل وما شابه ذالك من الامور المتعلقه بامور النظافه بكافه اشكالها وانواعها المختلفه . Yeah! That's True.. First Flight Booking And the money stake, affordable for anyone and you will not get much better. Such a Great post. Thanks for sharing with us. You are doing a great job please keep it up. Thanks for sharing the precise information.Being a frequent traveller, i would like to share the my personal experience. As i always use air vistara to book the flight using the coupons code. Many airbrush spray solutions include a bronze color guide, making application simpler to visualize. It’s possible for you to request a complimentary catalog from our site. As the Holiday Seasons, like Christmas, begin to wind down, you have to get in the shop and search for marked down items. Get to the local Best Buy store with the shop pickup option. An individual can pay a visit to any one of these stores if they would like to find suggestions and assistance or guidance in selecting the perfect accessories and parts. Coupon stores are the very best location to come across daily deals and promo codes for various products online. It would also create a wonderful Father’s Day present for dads that like smoked meat. 4Wheel Drive Hardware (4WD) is a leading mail order and Internet distributor of Jeep parts and related accessories. 4Wheel Drive Hardware (4WD) was established in 1977.As a division of Transamerican Auto Parts, 4WD is headquartered in Columbiana, Ohio.